Jim Doig as is indicated below had a short career as a marathon man but had immense talent – his first appearance in the Scottish Ranking Lists was in 1986 when he was sixteenth with a time of 2:20:56 run in Glasgow in September of that year. Colin Youngson put the following tribute together. In January 1992 Jim Doig died tragically young at the age of 34 from meningitis. However he had packed a great deal into his short life and is remembered with admiration and great affection by those who knew him. Jim was multi talented, extremely determined and modest. I clearly remember duelling with him during some very competitive Aberdeen training runs and races (before he outpaced me). His loss lingers sadly, since he was a wonderfully supportive team-mate, sensitive, thoughtful and cheerful company. In a second edition of Jim’s fascinating and detailed booklet about his adopted home, the ancient Deeside village of Kincardine O’Neil, his partner Linden Tapper wrote the following. (Some extra detail has been provided by Fraser Clyne). “Those who knew him may be surprised that he had time to sit down and write this history, since his public passion was running. Latterly he devoted his time to marathons. Many local people will remember seeing him pounding the Deeside roads, out in all weathers. His training paid dividends. He won both the 1987 Reykjavik marathon and the 1989 Bermuda marathon and represented Great Britain in the 1988 European Cup Marathon in Belgium. Fraser Clyne wrote the following in ‘The Green Final’ Aberdeen local paper. “The death of Aberdeen marathon runner Jim Doig (34) from meningitis came as a great shock to the North East’s athletics community. In 1990 he was ranked second in Scotland with a fine personal best of 2 hours 17 minutes 58 seconds set in that year’s London Marathon which was won by fellow Scot Allister Hutton. 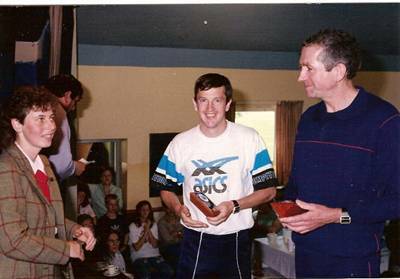 Despite hsi achievements at international level, the one performance that gave Jim greatest satisfaction on the domestic scene came when he helped Aberdeen AAC win the Edinburgh to Glasgow road relay title in 1986. Although extremely successful on the road racing circuit, Jim was more content running in the quieter surroundings of the Scottish countryside. He loved training in the forests and hills near his home in Kincardine O’Neil home on Deeside and often travelled further afield to take in a few Munros during some of his log runs. In 1986 he became one of a select band of long distance fell runners to have successfully negotiated the Bob Graham Round – a demanding 72 mile course of rough hill country encompassing 42 Lakeland peaks with 27000 feet of ascent and descent – which has to be completed within 24 hours. In 1988 and 1990 he he won the sort of race to which he was undoubtedly best suited – The Great Wilderness Challenge, a gruelling 25 mile run from Dundonnell to Poolewe through some of Scotland’s most spectacular scenery.